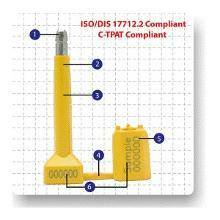 Klicker is an ISO 17712 & CTPAT compliant high security bolt seal. Unusually this seals barrel is constructed of high strength steel with an integrated locking mechanism for additional security. 1. High strength steel pin and barrel. 2. Anti spin locking mechanism. 3. High impact ABS coating. 4. Both seal parts are presented joined. 6. Numbers duplicated on pin and barrel. 1. High level of security - reduced losses. 2. Resistant to friction attack. 3. Protection and tamper evidence. 5. Marking cannot be replaced. Laser - stock items preprinted with text & sequential numbering.